Newcastle manager Alan Pardew was irritated by a "pathetic" touchline melee during the 1-1 draw against Southampton at St James' Park. Magpies goalkeeping coach Andy Woodman and Saints counterpart Toni Jimenez were sent from the dug-outs after a scuffle following a foul on Newcastle defender Massadio Haidara. 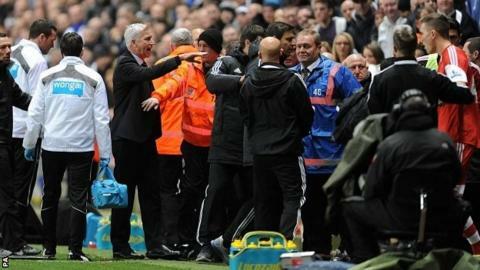 "The [incident] on the sideline was pretty pathetic," said Pardew. Saints boss Mauricio Pochettino said: "What happened is not a good example." The clash took place towards the end of the match, when Saints midfielder Morgan Schneiderlin was shown a yellow card for a late sliding tackle on Haidara. Staff from both sides were involved in the melee, with referee Mike Jones picking out Woodman and Jimenez as the guilty parties. "I think it is avoidable but in a high-intensity game such as that, any little spark can lead to something else and I think that's what happened," said Southampton's Argentine manager. Pardew added: "It was a bit of panto season. I'm not going to get carried away with that because it shouldn't take the headlines." Newcastle took the lead through Yoan Gouffran, who reacted first to Mike Williamson's header into the area before taking the ball around Paulo Gazzaniga and tapping in. Southampton improved after the break when Adam Lallana came off the bench - and he began a brilliant move that resulted in Jay Rodriguez scoring the equaliser.